Report by Michael Hayes who led the ride. On a crisp Saturday morning with the odd flurry of snow and a biting wind eight riders (including 3 new riders) set off from Peckham Square aiming to reach Hyde Park. Route took us twisting and turning through the back streets of Peckham, Walworth and Kennington. First stop was at the junction of Black Prince Road and Albert Embankment where one of our group pointed out the penthouse suite home of Geoffrey Archer (writer) overlooking the Thames at Vauxhall. Next on over Lambeth Bridge with views of the Houses of Parliament, the London Eye and Westminster Bridge. Then Horseferry Road and back streets, past the headquarters of the Conservative Party, via Storeys Gate and into Horse Guards Road and up to the Mall. On into Constitution Hill passing Buckingham Palace where the changing of the guards was in progress and the flag flying showing Her Majesty The Queen was in residence. 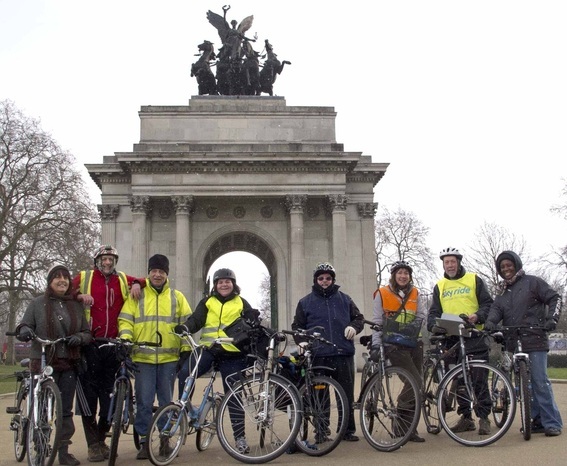 At the Wellington Arch a few adjustments were made to a bike saddle along with pumping up of the odd tyre or two. Before leaving this area Peter our resident photographer nabbed a passer-by to take a photo of the group with the back drop of Wellington Arch. Crossed Knightsbridge into Hyde Park where the group took a comfort break before heading back to our starting point in Peckham Square: Route back almost the reverse of the outward journey. However we took in part of Burgess Park before heading south along cycle route 22 back to Peckham Square. Well over our 2 hours set time for a Healthy Ride by 35 minutes. However all the new riders, including the 3 newcomers, will have bragging rights as they covered the best part of 14 miles. Well done to you all and hope to see you again on the next Healthy Ride. Healthy Ride Report, Feb 9th 2013. Six of us met up at Canada Water and took the Overground to Sydenham. Met up with 2 more riders at Sydenham. Unfortunately one of the bikes developed an unrepairable puncture at the base of the valve. No spare tyre. Peter offered to go to Forest Hill on the train and find the bike shop, get the bike fixed and lead back to Rotherhithe. So we split up with 3 riders heading to the bike shop and 5 riding straight back on the planned route (http://goo.gl/maps/jcDhj). Nice ride along Waterlink Way, then Ladywell Fields, Brookmill Park, Deptford paths. Noted work has started on the re-alignment of the Bush Road crossing on the Surrey Quays one-way for Connect 2. Everyone back safe, eventually. Monitored my heart rate which averaged 71% of max, the perfect level for training for aerobic fitness. The Healthy Rides living up to their name. Details here. Healthy Ride, 26 Jan 2013. 8 riders including one new rider. From Peckham Square to Bridge House Meadows, now re-opened with lovely smooth cycle path. Across Surrey Canal Rd (still no proper crossing), on by path to Silwood St, across Southwark Park to Thames at Kings Stairs Gardens. Along river to Dockhead, then Maltby St (queues too long at Monouth Coffee, as ever). Worked through to Burgess park via Bermondsey Spa Park, Russian Tank in Mandela Way, Surrey Square Park. Back to Peckham Square via the canal path. Nice weather, nice company, nice ride! 8 miles. were familiar but at least one rider must have behaved well last year, he proudly presented his new bike. Deptford blocked the obvious routes, we carefully detoured via the Bird's Nest roundabout and compensated for some gained time during an (optional coffee) stop in Greenwich. some padding via Russia Dock Woodland, Stave Hill (nice to watch the footrace to the top while using the leader's "I'll guard the bikes" excuse) and a fearsome descent of Dock Hill Avenue.